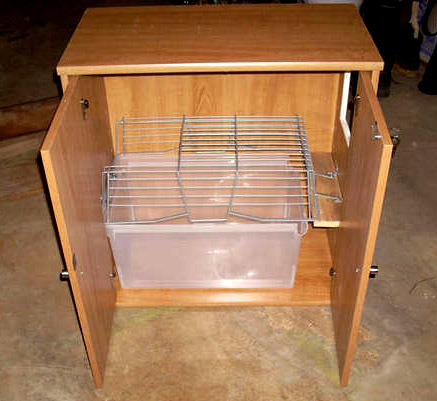 Make your own hidden litter box cabinet. You can camouflage you cat’s litter box and make it match your other furniture. These instructions are pretty good, but you will need some knowledge about the use of power tools. And you’ll need something like a jig saw to cut the opening. The design includes a wire platform made from an inverted wire basket to help get cat litter off your kitty’s feet. My cats wouldn’t like how open the grid is on the wire platform, so I would use something like a wire cooling rack (for baking) that has a smaller grid. Or you can leave the wire platform off. 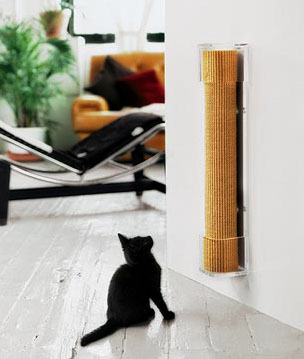 This sleek, wall-mounted scratching post by Wowbow is pretty nifty. I couldn’t find the Skritch for sale anywhere—the UK online store doesn’t seem to working. Too bad. Still, I thought it might give you DIY-ers some ideas. 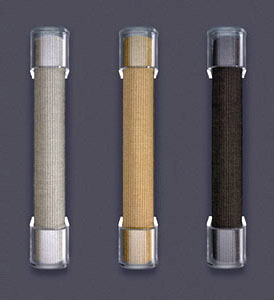 It would be pretty easy to wrap a heavy-duty cardboard tube with sisal carpet. The only trick would be finding something attractive to mount the post on the wall. Ideas anyone? 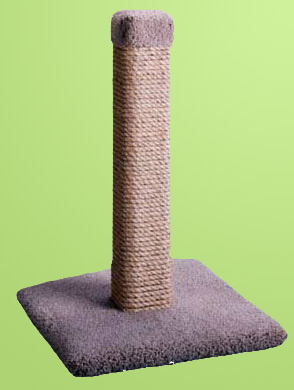 A minimalist scratching post could go almost anywhere and look nice—not to mention it would make your felines happy. I like that it doesn’t take up floor space. Check out the thumbnail to see how it looks with different colored sisal. You can also apply much of the advice, such as recommended base size for a post, to making a cat tree—check out these other posts on how to build your own full cat tree and how to build this monster cat tree. Your kitties will love you and you’ll love how much money you can save! Stumped by the cost of upscale cat trees? Judy DePasse of DePurrs Persians has some great instructions on building your own. It includes tools and supplies needed, dimensions, and instructions. It took her less than a day to build using mostly materials you can find at Home Depot or the like. Be sure you use sisal that doesn’t reek of oil, kerosene, etc. You probably won’t find that in most hardware stores. The stuff I’ve seen at Home Depot was too heavily oiled. Don’t miss these other posts on a DIY cat tree and a DIY scratching post.